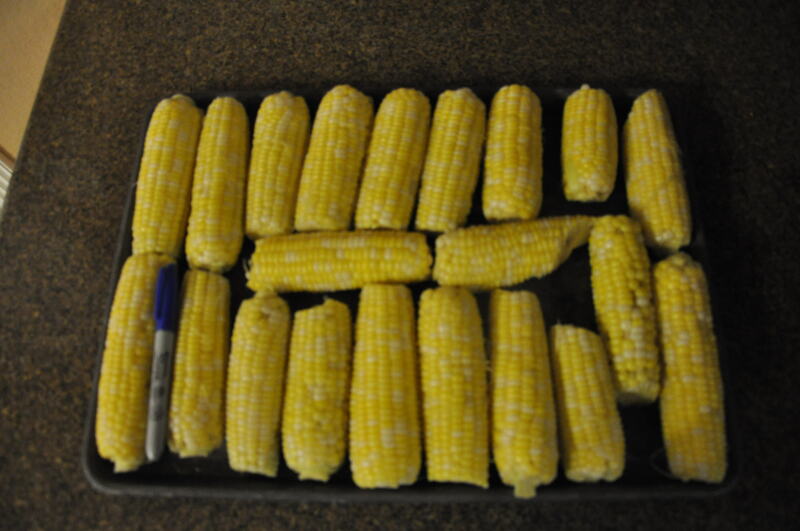 Fresh sweet corn on the cob is hard to grow but well-worth the rewards. We plant Ambrosia in both Spring and Fall. This year, we haven’t had a frost yet, so the harvest has been good! 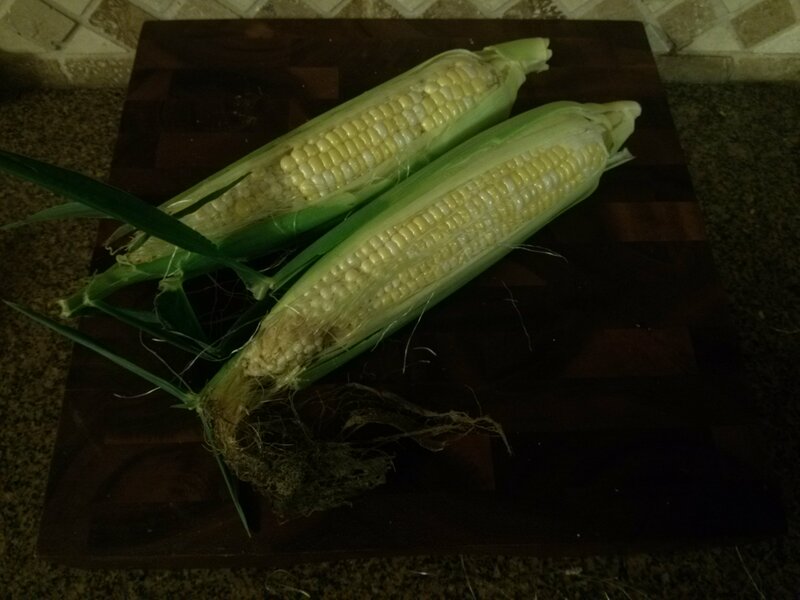 We planted on August 18 and harvested the first ears on October 18 (about 60 days). The treated seeds (pink kernels in the photo) are planted about 4 inches apart—-to ensure good germination numbers—-and are thinned to about 8 inches apart when the plants are about 6-8 inches tall. By thinning the plants, there is more available sunlight and nutrients for each remaining plant. A soaker-hose was placed on each of the 2 rows planted in August (shown in picture to right) to ensure moisture availability if there was no rain during the growing period. The first two ears (above) were picked on October 18, 2013 (to left) and and additional 21 were picked on October 20 (below) — about 12 ears will be ready to pick in a day or two. 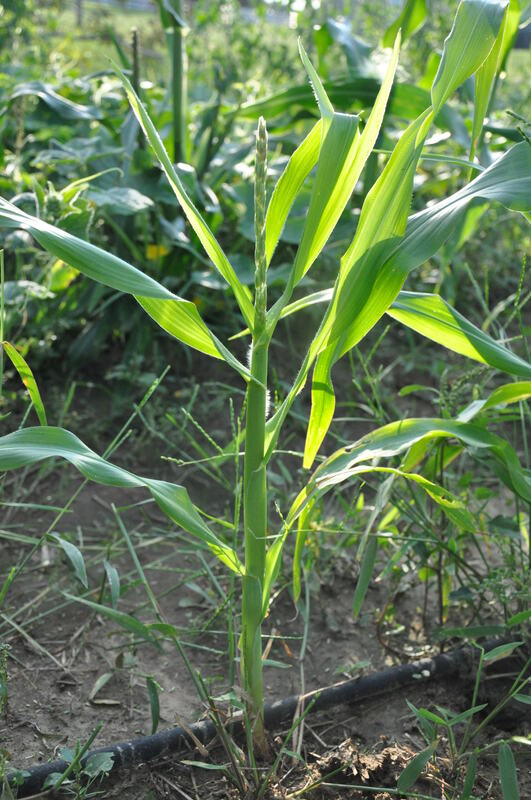 Corn is “monoecious” — the pollen and the ovary are on the same plant. The pollen is produced on tassels that rise above the corn ears and the ears produce “silks” that carry pollen to individual kernels. In the picture above — the two ears of corn — have darkened threads at the tips to indicate pollination has occurred (the silks are an off-white color and can be observed above the kernels where the husk — outer ear covering — has been pulled back. Also noticeable in the two ears of corn — the tips have damage from corn worms. We do not use pesticides on our garden vegetables, so damage is inevitable. The Ambrosia variety is an exceptionally good performer in our garden — little worm damage and high pollination levels for nearly perfect ears every time! In cooler weather, such as that we’ve experienced in the Fall (compared to Spring) also makes the corn sweeter (even better reason for taking a chance with a Fall crop!). The husks have been removed from the 21 ears (left), ears were blanched (dropped into boiling water for 1 minute) and then placed on the cookie sheet to freeze before packing into bags for frozen storage. Finally, because the corn did not germinate as good as expected, more was planted about 3 weeks later. Those corn plant are just now producing pollen (“tasseling”) and will probably not make corn because it will probably freeze before the ears are pollinated and complete growing (bottom picture).